"We are lawyers who work with the Open Rights Group. You and the Open Rights Group can make a huge difference in the UK and European courts, defending your digital rights. That’s why we are asking you to join ORG today, so they can hire a Legal Director. We need just 40 more people to hire them full time. “The appointment of a legal director will make a real impact on the work of the Open Rights Group. It has never been more important to have informed interventions at the High Court and appeal courts on matters to do with digital rights. David Allen Green, solicitor at Preiskel & Co LLP, and member of Advisory Council, ORG. "As an American lawyer I've seen how important it is to have boots on the ground to defend civil liberties in court. Even when the underlying law itself is designed to protect civil liberties, being able to appeal directly to the courts may be the only way to keep them protected not just in theory but in practice." 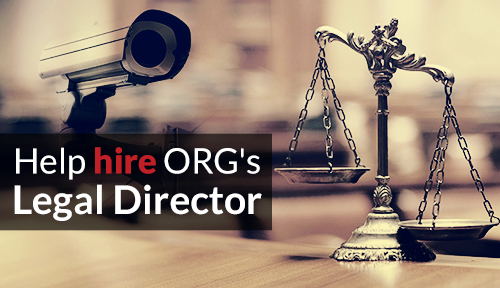 We need just 40 people to join to make this project happen.Please help us hire a full time Legal Director by joining the Open Rights Group today! British government to answer fast-track spy challenge https://www.privacynotprism.org.uk/news/2014/01/24/british-government-to-answer-fast-track-spy-challenge/"
Given this prompt I'd like to invite the academy to consider again the possibility of creating a network of digital rights cyberlaw clinics to provide ORG and their forthcoming legal director with pro bono support in critical cases.